Who are your top 10 customers? How much of your total turnover do they account for? What products do they buy? What don’t they buy that they should? 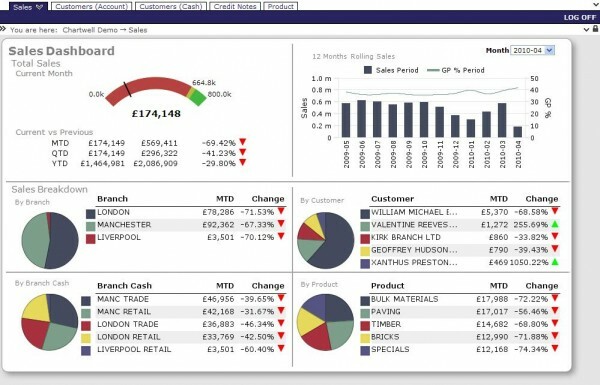 Business Intelligence is all about having immediate access to the information you need to make decisions about your business. The Diver Solution™ satisfies the information delivery needs of more than 2,600 customers and thousands of users world-wide and Chartwell IT is pleased to have been appointed as a reseller in the UK. Chartwell IT has extensive experience of using The Diver Solution™ to help businesses get the right information to the right people at the right time to make the best decisions. PDF documents with further information about The Diver Solution, including case studies, are available on our downloads page. Please contact us to arrange a demo of The Diver Solution with your own data.